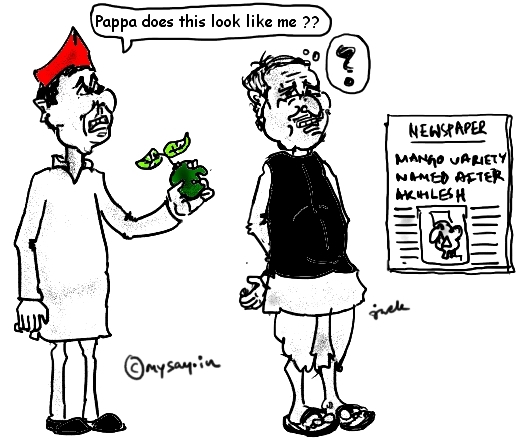 New variety of Mango named -Akhilesh Aam in Uttar Pradesh! A new variety of mango grown by Padamshree hoticulturist Kaleemullah Khan has bee given the name Akhilesh Aam(Mango), after the name of the present CM of Uttar Pradesh, who is also the youngest all Chief Minister of Uttar Pradesh,so far! Incidently the tree has produced fruits in 5 years time, as per , Mr Khan, which no mango tree does in such a tender age, it is named Akhilesh by him.